Reduce the image in size until it matches the pixel height/width you want. 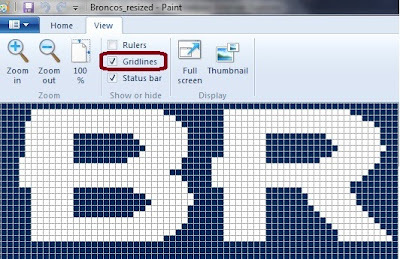 If you want the black grid, you can either turn that on in Photoshop, or do what K did: save out the image, open it in Microsoft Paint (with Windows 7 or Vista), zoom in a bit until the grid shows, then do a screen capture (PrtScn button on the top of keyboard). Then create a new image in Photoshop and paste the capture into it with Ctrl+P. Presto!